Trailblazers for the U.S. women’s national team can’t believe their successors are still having the same debate over equal pay and treatment. 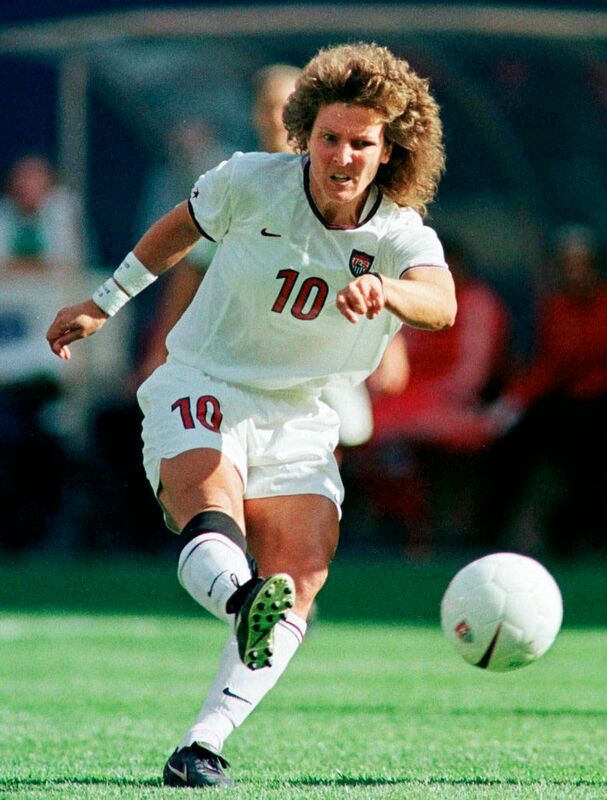 Michelle Akers and Julie Foudy, U.S. national team players on the 1991 and 1999 World Cup-winning teams, were among the women who drew attention to the issue two decades ago — when a group of players first took a stand over Olympic bonuses. Past battles give context to the current dispute between the national team and the U.S. Soccer Federation. The 2015 World Cup champions recently filed a complaint with the federal Equal Employment Opportunity Commission claiming wage discrimination by the federation. The filing points out the disparity in the pay structure for the men’s and women’s teams. 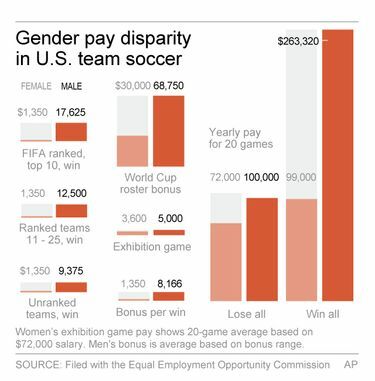 The top female players are paid a salary of about $72,000 a year by U.S. Soccer to play in a minimum of 20 exhibitions per year. They are awarded bonuses only if they win those games, with the potential to earn $99,000, the complaint said. Conversely, the men are paid a minimum of $5,000 for each match. Compensation varies with the level of opponent, based on FIFA ranking, but male players can earn up to $263,320 if they win all of their games. Among the other examples cited in the filing: For making the World Cup roster, the women receive a bonus of $30,000 and the men $68,750. Ranked No. 1 in the world, the U.S. women are coming off a wildly successful year. Not only did they win the World Cup in 2015, but the victory drew record television ratings (25.4 million viewers). The team helped generate $17.7 million more in revenue than expected for the USSF. Also, the players are currently in a contract dispute with USSF. The federation filed a lawsuit against the women’s union seeking to clarify the length of the collective bargaining agreement, which it says is effective until December. The players’ union maintains it expired in February and retains its right to strike. That leaves the team in uncertain territory heading into this summer’s Rio Olympics, where the Americans will try to win their fourth straight gold medal. While some retired players don’t think the U.S. team will strike, it’s not completely off the table. The EEOC filing is the latest salvo in what has been a long-simmering issue for the national team. Back in 1995, a group of high-profile players including Akers, Foudy, Mia Hamm, Kristine Lilly and Joy Fawcett were locked out of a pre-Olympic training camp by the USSF because of a disagreement over bonus pay. The federation had offered a bonus only for the gold, the women wanted incremental pay for medals. The men were given bonuses per win. The dispute was quickly settled. It was especially emotional for Akers, who was among those working hard to bring women’s soccer to the Olympics. The Americans won gold in the sport’s debut at the 1996 Atlanta Games. Following the team’s dramatic victory on penalty kicks in the 1999 World Cup final against China, the players boycotted a tournament in Australia. They eventually came to terms on a five-year deal that extended through the 2004 Athens Olympics. The last collective bargaining agreement between the federation and the players’ union expired following the 2012 London Games, but it was extended by a memorandum of understanding that included salaries and participation in the National Women’s Soccer League. U.S. Soccer President Sunil Gulati defended the federation’s leadership in a recent conference call, saying it is committed to working with the players’ association on some of the issues and is confident an agreement will be reached. But U.S. Soccer also points out that revenue figures from the past year do not show the whole picture because they don’t include a men’s World Cup year. In the four-year cycle between the tournaments, the federation claims the men’s team generates about twice the revenue as the women’s. While not providing concrete figures for those claims, the USSF pointed to attendance for men’s and women’s matches from 2011-2015 as an example of one revenue stream: The men averaged 29,751 fans, while the women averaged 16,229. For the players, it goes beyond equal pay. AP Sports Writer Melissa Murphy in New York contributed to this story.